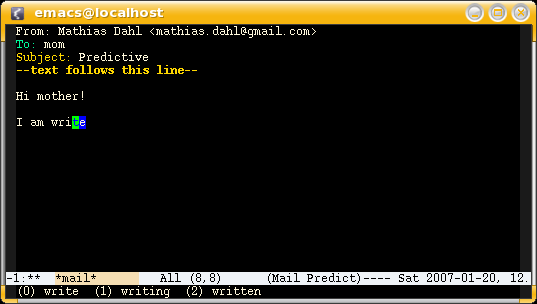 Predictive is a package for the GNU Emacs Editor that helps you write text faster. It does this by trying to predict what you are going to write by looking at the first few characters of each word you type, looking into a dictionary for matching words, and suggesting words from this dictionary. Mathias goes on providing all the details you need to get stated with Predictive. Although i have not yet used it, looks pretty interesting. Oh, as an aside, i recommend taking a look at Tony ‘Qubit’ Cubitt’s site for more Emacs (and non-Emacs) goodies, or just to enjoy a beautiful website. Wow, quite impressive. Full disclosure: I’m a vim user. Not to say that I like editor wars. No siree. I read your blog every other day or so to see what cool new developments are being made in the emacs camp. Predictive text for general entry is one of the features I’ve longed for ever since discovering the tab key in bash and texting on a cell phone. Sigh. Guess I’ll just have to wait. I would like to use this feature but the download page on dr-qubit.org is not functioning. Do you know of another location where this package ‘predictive.tar.gz’ can be downloaded. I tried it and it is very slow. To Eli: Did you compile predictive? Just go to the directory where you put the files and execute ‘make’. This will byte-compile elisp files. If you don’t have make at hand, use the dired package to byte compile the el file (shortcut B after having selected the el files).